AuthenTec, which we all know best from the fingerprint sensor on the Motorola ATRIX 4G, and those sensors on our laptops, was just reported bought out by Apple, for the cool $356 million. What is Apple planning to do with the biometric security company is not clear at this point, but it paid $8 pre share for the company whose shares closed yesterday at $5.07 - a nice 58% premium, which might have made a lot of people privy to the deal much richer overnight. One thing can be deduced with a great degree of certainty, though - biometric security might be coming to Apple's gadgets with this AuthenTec acquisiton, as that's what the company does, and Apple already has patent filings on the matter. Patents might be another reason Apple acquired it, since the company has more than 200 patents filed that span the gamut from biometric security to secure VPN clients. Samsung just chose the QuickSec VPN security of AuthenTec to better its Android smartphones and tablets enterprise readiness, but what will happen with that partnership now that Apple's the owner, remains to be seen. Check out AuthenTec's promo video for its mobile fingerprint sensor on the ATRIX 4G to gain some perspective what might be in store for Apple's future gadgets. i am an android fan, but if apple manage to put a biometric sensor on the SCREEN, i admit it would be pretty cool. If they manage to do that, it won't debut until the iPhone 5S or 6. I see the biometric portion being used on Macbooks more than phones. VPN aspects are more likely to be for the iPad. 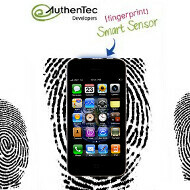 Soon to be renamed iAuthenTec but, iAm sure Android will have biometric unlocking before Apple releases it on iPhone 12S. No of course they don't. Where did you read such lies? It's just Apple - because they are evil. Did I mention that Google doesn't buy companies? Yes they recently bought Sparrow. What's your problem now? Was that at me or darkkjedii? Eitherway, since you just acknowledged that Google bought sparrow recently in order to use them to improve their own mail apps. How does what you originally said make any sense? 'Typical Apple move'? Perhaps I'm missing some other meaning. I meant that comment for darkkjedii, When companies apart from Apple & MS buy companies they try to develop their own and make profit, but Apple and MS mostly buy for Patent. That was missed in my previous comment. They average about 1 per week. Nothing wrong with buying up technology as long as it doesn't lead to monopolistic practices. +1 for the teenage girls joke lol. I already told you taco, they bought an entirely different system that is nothing like todays tech. Just give up and go to your stall at taco bell. Apple dont make phones either and look at them now.. you dont need to invent anything as long as you have the patent or have companies that will do it for you.. Practice what you preach, little boy. "AuthenTec, which we all know best from the fingerprint sensor on the Motorola ATRIX 4G, and those sensors on our laptops" I am certain that Apple eventually is going to do that including Google and Samsung. innovation stallers... they bought you Siri.. which now you can enjoy a Siri-like app every new Android device... how dare you..